Click Dup button to open a copy of selected user settings for editing. Enter a single word, case-sensitive, alphanumeric User Name to use to login to the NVR. Enter a single word, case-sensitive, alphanumeric User Password and re-type it to the User Password Confirmation to be sure it is typed as desired. Enter the Number of Active Users to define the number of Client instances the user can be signed into simultaneously. Enter Max connection time to define the number of minutes user can be continuously connected to the NVR before the connection will be terminated. User may login again if desired. A value of 9999 designates no time limit. Check Master User checkbox to give the user permission to terminate other user sessions from the Client — Get Users. Check Can Search Archive checkbox to give the user permission to view/search NVR archive. Usernames and passwords are case sensitive! Unless otherwise configured for security reasons, it is recommended to have at least 2 Number of Active Users allowed per user definition. In the event that a user’s session is not logged out properly, this ensures that they can log in again without intervention from a Master User or NVR Administrator. The next step is to define which of the available cameras the user has access to. And also assign the level of authentication allowed from this user to the camera defined in the NVR Control Center — Cameras — Security & Alarm. In most cases, the camera has only one username and password, with administrative privileges. Be sure that User Rights (Adm/Oper/User) settings make sense considering the authentication settings in the Security & Alarm. 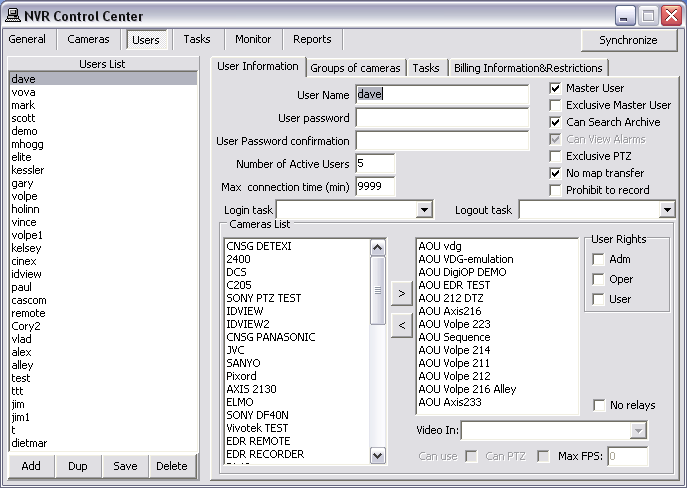 Select a camera from the Cameras List at the left and click ">" button to add the camera permission to the user — the camera name appears in the selected cameras list at the right. Select the camera name in the selected cameras list at the right. Repeat steps 11-14 to add more camera permissions.